Call it an adolescent growth spurt: JDS Development’s skinny West 57th Street condo tower could get 200 feet taller. 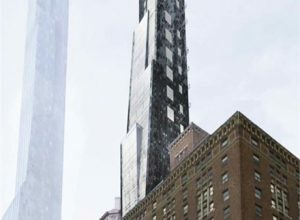 A partnership led by JDS and Property Markets Group may increase the height of the Cetra/Ruddy-designed hotel-condo project slated for 107 West 57th Street. The group recently acquired the 247,000-square-foot Steinway Hall building next door at 109 West 57th Street for $46 million, which would allow the developer to boost the height of the Cetra/Ruddy project up to 900 feet, The Real Deal reported. JDS and PMG paid $40 million for a stake in 107 West 57th Street between Sixth and Seventh avenues, with plans for a 679-foot-tall, 51-story building on the 43-foot-wide lot. Originally, the development was supposed to have about 28 residential units, although that figure could change with the acquisition of the Steinway site, which has almost 45,000 square feet of air rights. Kevin Maloney of PMG told The Real Deal that the project will likely be anchored by a hotel with condos above. The homes will have clear views of Central Park.